The port city of Beira after Cyclone Idai tore into central Mozambique. Mozambique's president has described Idai's aftermath as "a real disaster of great proportions." He has spoken of flying over submerged villages and seeing bodies floating in the floodwaters. 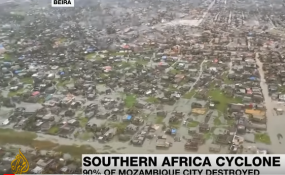 The death toll in Mozambique following tropical cyclone Idai could reach 1,000, the country's president said on Monday. President Filipe Nyusi said he had flown over the affected region, where two rivers had overflowed. "Everything indicates that we can register more than 1,000 deaths," he told Radio Mocambique. Cyclone Idai could prove to be the deadliest storm in generations to hit the impoverished southeast African nation of 30 million people. Idai first made landfall on Mozambique's central coast on Thursday night, cutting off more than half a million people in the Indian Ocean port city of Beira. The situation could be far worse in the surrounding areas, which remained completely cut off by road and where houses were not as sturdy, said Caroline Haga from the International Federation of the Red Cross official, who was in Beira. The Red Cross said 90 percent of the city was damaged or destroyed. The cyclone knocked out electricity, shut down the airport and cut off access to the city by road. A large dam burst on Sunday and cut off the last road to Beira, LeSueur said. Idai moved inland to neighboring Zimbabwe, unleashing fierce winds and flash floods and washing away roads and houses. The official death toll reported by the information ministry was 98, with at least 217 more missing; however those numbers were expected to rise. Zimbabwean President Emmerson Mnangagwa cut short a visit to Abu Dhabi to return home on Monday. "With every hour and day that passes, our worst fears become increasingly real," he said in a statement "Many drowned while others were killed in their sleep from swift and unexpected rockfalls which demolished their homes". The death toll in Malawi from heavy rains and flooding stood at 56 as of last week. No new numbers had been released following the cyclone's arrival in the country. Germany's foreign office sent its condolences to the victim's loved ones in a message posted on Twitter. "It is with great shock and dismay that we learned about the situation in Mozambique and Zimbabwe where the cyclone "Idai" already left hundreds of people dead. Our thoughts are with the victims and their families," the message read.